This new double white bell flower puts on quite the show! It is an easy spring blooming perennial for the shady woodland garden. Featuring showy floral displays with a large number of blossoms per plant and rich flower colors, the plants produce bushy clumps of thick, leathery evergreen leaves and flower stalks that appear in early spring. They bear showy cup-shaped blooms that will grab your attention. Helleborus 'Wedding Bells' is the hand-pollinated seed strain that brings quite a bright show in late winter in a woodland garden. It blooms best in winter, naturalizes quickly, and spreads out in moist, woodland areas creating gentle bursts of needed color in the shade of early spring. 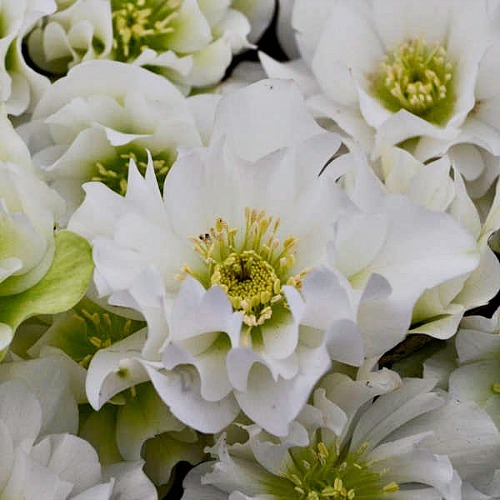 The hellebores blushing bridesmaid blooms for six weeks or more beginning in late winter. They perform best when grown in winter soil type or any well drained soil and semi-evergreen sunlight or partial shade. It requires minimum maintenance as these plants love spreading their roots out in moist shaded woodland areas. Many thanks to Walter's Gardens for use of their beautiful image. Helleborus Wedding Bells is grown in a one gallon container. Plants shipping to AZ and CA addresses will be bare rooted and root washed before being prepped for shipping.